At Hammerworks our Classic Design Tin Wall Sconces S114 are among the finest handmade lighting reproductions in the USA. Most importantly since 1979 we have been handcrafting each Rustic Style Wall Sconce proudly in America. Not only that, we employ the same tools and techniques as our Colonial forefathers. Consequently our Vintage Wall Sconces are authentic 18th century reproductions. As a result our Early American Wall Sconces combine beauty and function making them a versatile decorating accessory for any room. Each Antique Reproduction Wall Sconce is beautiful in its’ simplicity. They provide a warm glow, perfect to illuminate a dark hallway or as accent lighting in a bathroom, bedroom or living area. Also all our Colonial Wall Sconces are handcrafted from solid copper, brass or tin, providing versatility in coordinating with the color scheme and style in any room. 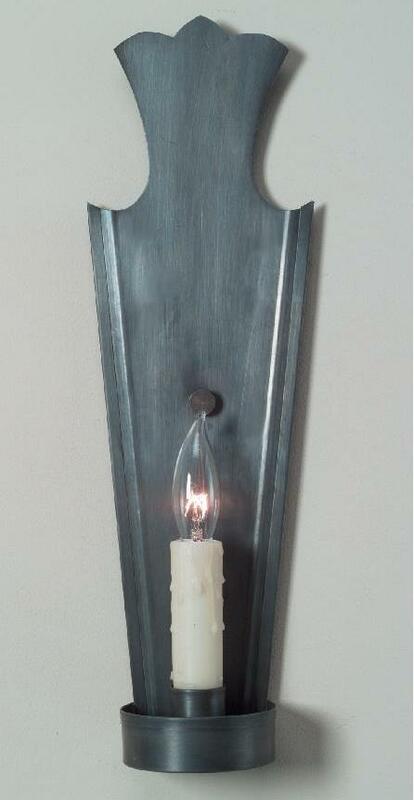 We offer several Rustic Tin Wall Sconces with 2 or 3 candles making them ideal for areas requiring additional lighting. Furthermore Antique Wall Sconces are UL listed and can accommodate 60 watts per candelabra socket. Whether you have a reproduction colonial, saltbox,farmhouse or New England cottage, we offer a Colonial Tin Wall Sconce that is perfect for you. Not only that, we often provide wall sconces to restaurants and other commercial establishments. Our Colonial 18th Century Tin Wall Sconce styles range from primitive to elegant. From a simple Antique Reproduction Sconce S105 to our collection of impressive Colonial Cut Mirrored Tin Wall Sconces the possibilities are endless. While our Antique Reproduction Wall Sconce adds charm to the overall design of any setting, proper placement is important. Thus, always consider height as well as room location. Therefore you should install sconces at the correct height level when coordinated with artwork or above fireplace mantles. In addition an area behind a chair or sofa or over a desk is an ideal location to provide additional lighting. Finally, no matter the size or style Reproduction Tin Wall Sconce you are shopping for, Hammerworks is the clear choice.